Nearly three-quarters of African American parents and families (74 percent) believe that the education black children get isn't as good as the one that white students get. Nine in 10 think schools in white communities get more money than the schools in black, Latino or Hispanic neighborhoods, a certainty that was only 83 percent in 2016. A slight majority of Latino parents and families (52 percent) believe Latino students receive as good an education as white students. 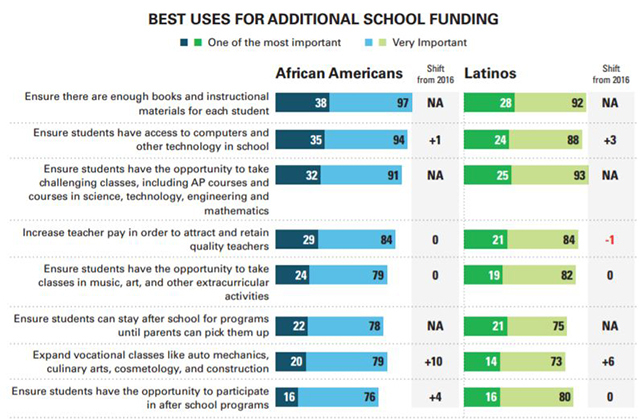 And almost six in 10 (57 percent) think schools in Latino communities receive less than schools in white communities. The results came out of this year's "New Education Majority Poll," a survey run by the Leadership Conference Education Fund for the second year in a row. The Education Fund is a nonprofit that works on laws and policies to "promote and protect the civil and human rights of every person in the United States," according to its website. The intent of the survey is to capture the beliefs of black and Latino people to understand their perspectives, aspirations and concerns about their children's education and the education system. The polling was done by phone during March 2017; complete surveys came in from 600 African American and 600 Latino respondents, all of whom are "actively involved" in bringing up a child between the ages of five and 18. According to the report's authors, the lack of funding and resources for students of color is viewed as the biggest cause of racial disparities in education, reported by 67 percent of black respondents, an increase from 60 percent last year. Among Latinos, lack of funding was cited by 56 percent of survey participants, down from 57 percent in 2016. If schools in low-income areas were to receive additional funding, both groups of parents would prioritize putting more computers and other technology in those schools above increasing teacher pay to retain quality teachers, adding art or music classes, allowing students to participate in after-school programs or expanding vocational offerings. Given eight choices for how to spend additional money, both groups of respondents chose the same three categories, with slight variation in the order: ensuring there are enough books and instruction materials for each student; providing access to computers and technology in school; and offering the opportunity to take challenging classes, including AP courses and courses in science, technology, engineering and mathematics. When asked an open-ended question about what the most important characteristic was for being a "great school," respondents chose "good teachers" above and beyond any other factor (50 percent among black respondents and 45 percent among Latino participants). The next closest choice was "general curriculum," picked by 19 percent of African American parents and 16 percent of Latino parents. Both Black and Latino respondents overwhelmingly said they believe that students today should be challenged more in school than they currently are. The complete survey results and related materials are openly available on the Leadership Conference Education Fund website.